Get ready for all Hallows Evening! 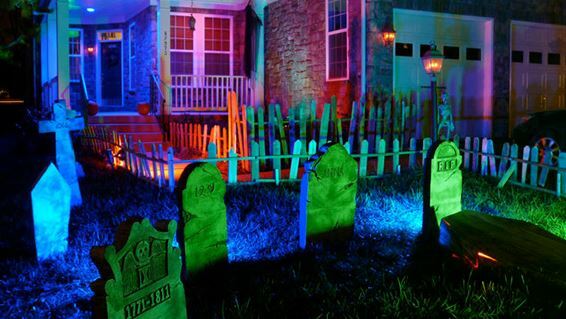 Idea's to transform your house, landscape or venue into a spooktacular sight that is sure to cause a fright or even delight. 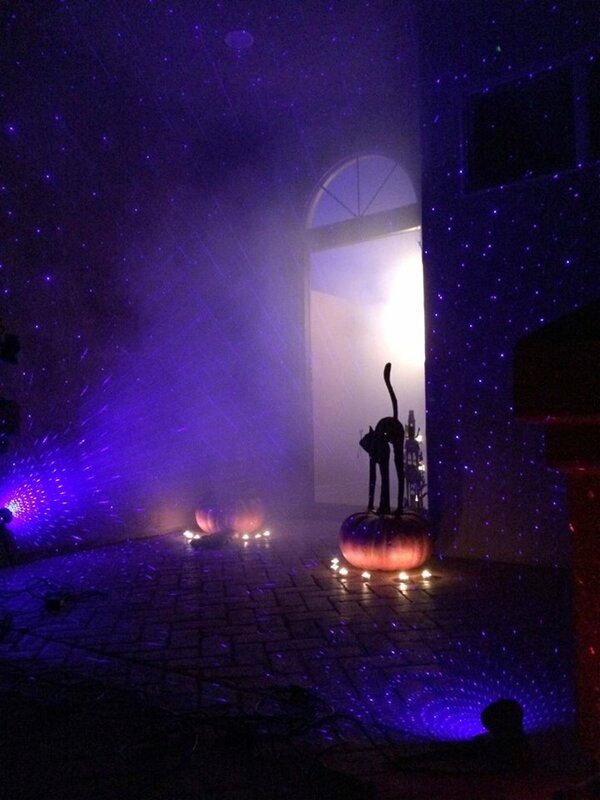 Every party or haunted house needs Halloween lighting and decorations. Enchant all who dare to enter with a simple lighting display or get as complex as you would like. We have many great outdoor lighting projectors to create the look above, any red laser projector will do it. Use your imagination, mix and match laser projectors, LED flood lighting and other light projectors. Pumpkins are always a great decorating tool. They don't even have to be carved, but can be a day or so before to preserve them. 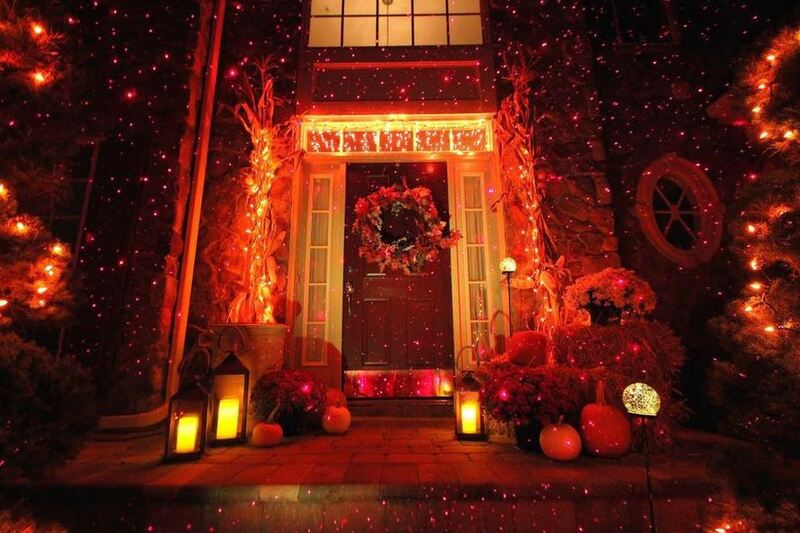 Another great option is to add a moving hologram light projector to display decorative holiday patterns. Check out the Night Stars Moving LED Light Projector with 12 Color Slides, below is an image of the flying bat pattern which is included with the projector! Simple black poster board or construction paper can be cut into tombstones, ghosts, witches, bats or such and placed in windows as silhouettes. Leave a light on behind the object and create an easy scene. Ghosts can be made scary or not. 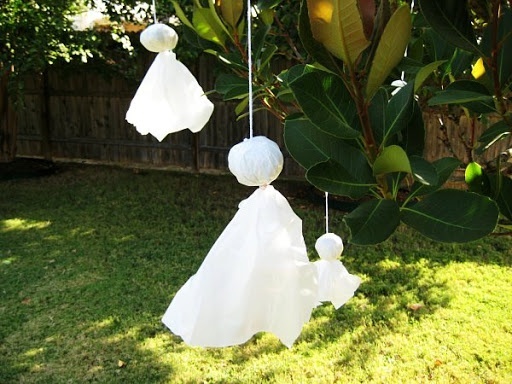 Simple to do and can add an inexpensive flare to any yard, porch, tree or patio cover! 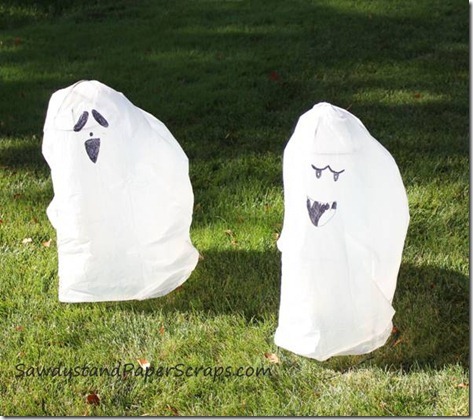 Just take white kitchen trash bags(unused of course), add a face with black felt tip pen, cut the opening edges into ghostly tails if you desire. Stuff the head with an old newspaper, secure with white yarn or string. Hang with yarn or string so they appear to float! If you really want to get fancy use light flexible wire fence material and shape it so that the white bag will fit over it. Add an inexpensive battery operated votive inside to light it up! Psst....black trash bags can be used in a variety of ways also! Bats, spiders, creepy curtains and body bags are just a few DIY uses! If you are considering special effects, a fog or smoke machine is the best bang for your buck! Simple to use, indoors or out. Create a layer of non-toxic fog for your yard, porch, or venue. Combine with any laser light projector or LED accent light and the fog will enhance the lights or any lighting. You've all seen the store bought bags of cobwebs. These are inexpensive, you can use a little or a LOT! Add dimension to any eerie fright night display. They are visible during the day as well. Great for indoor use also. The above are all just helpful fun idea's, with links that are not necessarily representative of products offered by LasersandLights.com but most are! Email shop@lasersandlights.com if you need any assistance.